Although we tend to think of Edinburgh in terms of the Mediaeval and the Georgian, it is also a fine Victorian city. (This is as it should be, for the idea of ‘Scottish-ness’, as we currently understand it, was invented by that giant of the Nineteenth Century, Sir Walter Scott.) The area known as the West End bears architectural testimony to the admirable qualities of Queen Victoria’s Scottish subjects: carefulness, substance and respectability. It is full of rows of stone-built homes, which are large within and elegant without. Rothesay Terrace – named after the Dukedom given to the Monarch’s eldest son – is one of the most handsome. It was built in the 1890s for those who were going to be important. The first occupant of number 7 was Andrew Graham Murray, who became the Lord Advocate of Scotland. This property is now one of the three adjoining houses which comprise The Edinburgh Residence. This is a splendid place in which to stay, when you visit the Scottish capital. The entrance hall is certainly of its period. Good woodwork abounds, and the staircase has about it a touch of Imperial grandeur. And so does the Drawing Room, to which I immediately repaired upon arrival for some refreshment. Here, comfortably settled in a red wing chair in the bay window (how our Victorian forebears loved their bay windows) with a view over the Dean Village below, I tucked into the set afternoon tea (£13.95), which is served from noon until six o’clock. I mean ‘tucked’, too, for all the comestibles – brought by one of the friendly waiters – were utterly delicious. I particularly like the scones (not too sweet), the beef and horseradish sandwiches and the little pot of raspberry cream. True, there were tea bags in the pot, instead of loose leaves, but I was willing to forgive this minor blemish. Then I was taken up in the lift to the third floor by the resident manager, Craig Robertson. I should say a word about Mr Robertson, for he displayed a remarkable dedication to making my stay as pleasant as possible. He rushed hither and thither, fulfilling (and sometimes anticipating) my whims and working like the proverbial Trojan. In this he proved typical of his colleagues. Clearly, the General Manager, Christiaan Venter (from South Africa), is doing an inspirational job at the helm. In a small hotel like this – there are just 29 rooms – such attentive service creates a sense of being pampered, and I do like being pampered. Room number 28 was a Town House Apartment and therefore £295-£500 a night, according to season. 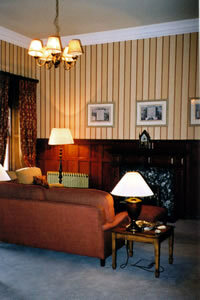 (The other categories available – all rooms are designated as suites – are Classic at £125-£300 and Grand at £200-£400.) From the corridor I entered a substantial hallway – decorated with red wallpaper – with a cloakroom and shower room off to the left. At the end of the hall another door opened into the sitting room. 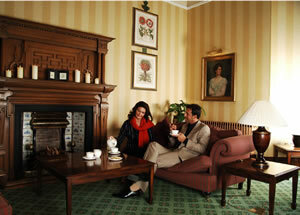 One of the attractive features of The Edinburgh Residence is that the accommodation it offers is very spacious. This room (pictured) was about 20 feet by 16 feet, and – with its high ceiling, fireplace and half-panelled walls – had a somewhat baronial feel. It was certainly large enough for a heavy sofa, two easy chairs, a dining table and four chairs and a tall cabinet decorated with faux-books. This last could, apparently, transform itself into another bed, should the need arise. Another cabinet held a refrigerator, glassware, cutlery and a microwave oven. 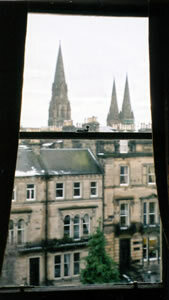 From each of the three casement windows was a view (pictured) of one of the city’s Victorian masterpieces: the Episcopal Cathedral of St Mary, by Sir George Gilbert Scott. Breakfast (£12.50) is served in one’s own room. I was properly dressed for these occasions, of course, and enjoyed the pleasant impression of being in my own property, with an attentive butler. Each morning I worked my leisurely way through porridge, bacon, sausages, tomatoes, mushrooms, fruit salad, croissants, toast and Earl Grey tea – all tasty and carefully presented – as I gazed out at the cathedral’s trio of gothic spires. On the other side of the hall was my bedroom, graced by more panelling and a second fireplace (neither worked, sadly). The bedstead of brass and iron and the mahogany dressing table reinforced the sense of period. The bathroom was a contrast. 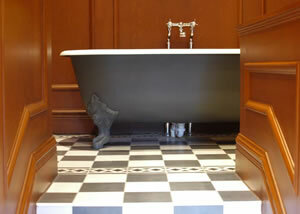 Its bright spotlights shone onto dark blue tiles, a bidet, a wash basin, a loo, a tub of good size and a separate shower. The wine list is short – just 22 bottles and four halves. Prices are likewise modest, with the most expensive still wines being a 2008 Chablis (Dom. Colombier) at £37 and a 2004 St Emilion (Ch. De Rocques) at £36. Louis Roederer champagne is £55. My South African chenin blanc was smoky and full of citrus fruit and an enjoyable quaff for just £15.50. 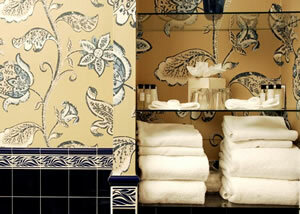 The Edinburgh Residence offers hospitality of a high order. Its accommodation is spacious and comfortable, its food is enjoyable and its young staff is exceptionally pleasant and eager to please. I will certainly look forward to my return. 7 Rothesay Terrace, Edinburgh EH3 7RY, Scotland. Double rooms from £125-£300, according to season, breakfast extra.